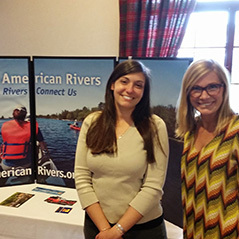 American Rivers combines national advocacy with field work in key river basins to protect rivers, restore damaged rivers, and conserve clean water for people and nature. To do this, they build partnerships and work closely with local river advocates, businesses and agriculture interests, recreation groups, and others to forge solutions. In the Upper Mississippi River, American Rivers is working towards a healthy and sustainable Mississippi River with naturally functioning ecosystems, like floodplains and wetlands that are restored and protected for people and wildlife. During the past two years, they have achieved a number of successes. A large part of the organization’s strategy is facilitating positive change through partnerships with organizations and individuals who share a committed to restoring the Upper Mississippi River. Blue Trails Associate Director Staci Williams has presented at the annual Upper Mississippi River Conference on the benefits of natural floodplain protection, and Olivia Dorothy, Associate Director for Mississippi River Management, marched in the Great March for Climate Action. In 2013, American Rivers partnered with the Dutch Embassy to present “Adapting to Climate Change in the Mississippi,” an international symposium investigating climate adaptation strategies in the Mississippi and Missouri basins at Washington University in St Louis. American Rivers continues to combat the threats the Mississippi River faces from climate change, outdated transportation systems, and harmful agricultural practices. They have named the Upper Mississippi River basin as a priority basin, and will develop a 5 to 10 year strategic plan with measurable conservation outcomes to track our progress. American Rivers is working at the national level to facilitate policies and funding that encourage on-the-ground river management reforms and floodplain protection and restoration, and at the local level, they are facilitating the Nicollet Island Coalition stakeholder group that consists of taxpayer, conservation, and environmental advocates and focuses on reforming the Corps management and operations on the Upper Mississippi River navigation infrastructure.